An original April-May 1968 UK tour programme clearly signed inside by ; Don Partridge / Amen Corner (all seven members) and Simon Dupree Big Sound (four members) . 1) AMEN CORNER autographs. Welsh group formed in Cardiff who scored several UK Top 10 hits during 1968-69 including ; Bend Me Shape Me (No3 1968) / High in The Sky (No6 1968) / Hello Susie (No4 1969) and the classic "If Paradise Was Half as Nice" (No1 1969). 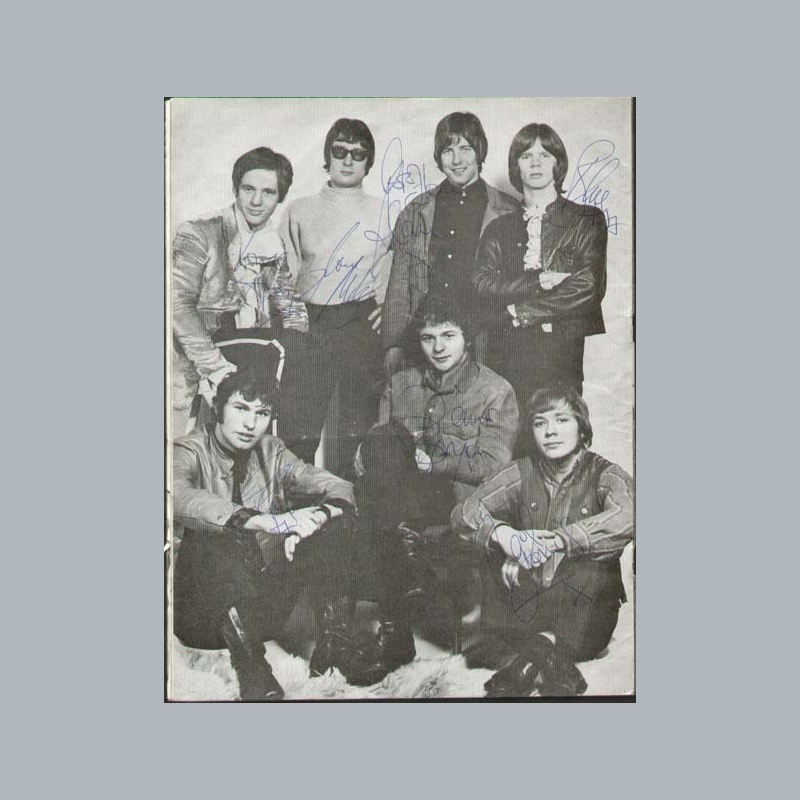 Their page in the programme clearly signed in ink by all seven group members ; Andy Fairweather Low (vocals) / Neil Jones (guitar) / Alan Jones (sax) / Mike Smith (sax) / Blue Weaver (keyboards) / Clive Taylor (bass) and Dennis Bryon (drums). 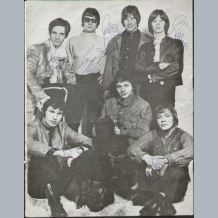 2) SIMON DUPREE & THE BIG SOUND autographs. British psychedelic rock band active between 1966-69. The group were signed Parlophone and their first few singles notably "I See The Light" (1966) failed to chart. In October 1967, the group's management and their record label decided to try moving Simon Dupree and the Big Sound in the direction of psychedelia. They broke through at the end of 1967 with their UK Top10 single "Kites". Regarding themselves as blue-eyed soul brothers, they did not like it as it was unrepresentative of their usual style. The follow-up "For Whom The Bell Tolls" was only a minor hit and a subsequent single "Broken Hearted Pirates", featuring an uncredited Dudley Moore on piano made no further impact. A then unknown keyboard player by the name of Reginald Dwight was hired to fill in for an ill Eric Hine and he joined them on a 1967 tour of Scotland. They were asked to allow him to stay on and he was almost recruited as a permanent member. They politely rejected the chance to record any of his compositions (although they did ultimately record "I'm Going Home" as the B-side of their final (contractually obligated single) and laughed when he told them he was adopting the stage name of Elton John ! Frustrated as being seen as one-hit wonders they disbanded in 1969 and the Shulman brothers went onto form the successful progressive rock group Gentle Giant. 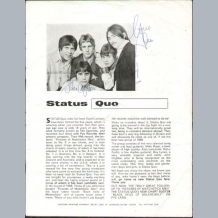 Their page in the programme clearly signed in ink by four group members ; (Brothers) Derek / Phil and Ray Shulman and Eric Hine. 3) DON PARTRIDGE autograph d2010. English singer-songwriter known as the "king of the buskers". He performed from the early 1960s as a busker / one-man band and achieved unexpected commercial success in the UK with the songs "Rosie" and "Blue Eyes". He died of a heart attack aged 68 in 2010. His page in the programme clearly signed in ink by Don Partridge. Condition ; Fair-Good. We would rate as 7/10. Email us to see remaining images of this item. CERTIFICATION ; Just one item in an extensive pop music collection all obtained by Alan Jones who played saxophone as a member of the successful late 1960s Welsh group Amen Corner, best known for their 1969 No1 hit single "If Paradise was Half as Nice". There is a copy of a letter from him further detailing a general history of his collection included. 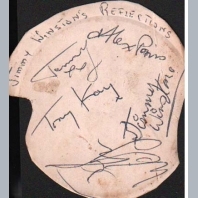 The signing dates of this programme are between April and May 1968 as he was on this tour. AFTAL Dealer No13 and UACC RD Memorabilia UK COA. 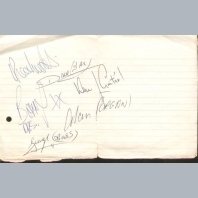 GENE PITNEY / AMEN CORNER / SIMON DUPREE (BIG SOUND) / DON PARTRIDGE and STATUS QUO autographs. We have no archived items for Amen Corner & Simon Dupree Big Sound.